Academy Awards: Won for Best Cinematography; Best Art Direction-Set Decoration. 1948. DVD: Standard 1.33:1; audio English Digital Mono; subtitles none; closed-captioned; single sided - dual layered; 26 chapters; Not Rated; 101 min. ; $39.95; street date 1/30/01. The story concerns a group of nuns who attempt to create a school and health station in the Himalayas. They use a literal former pleasure palace for their building, but their attempts to transform this building of sensual delight into a staid, devout place doesn’t really take. Instead, the terrain seems to change the nuns, as they all begin to behave in modestly unusual ways. The main point involves hunky English handyman Mr. Dean (David Farrar). He ignites the passions of at least two nuns, though only one - Sister Ruth (Kathleen Byron) will admit it; the other - head nun Sister Clodagh (Deborah Kerr) denies any lustful interest, though she finds herself mooning over her own lost love. BN covers the actions of the nuns and their charges, but it’s really the subtext that offers the most compelling part of the story. On the surface, not a lot happens in the film, at least until the psychologically-charged ending. Otherwise, we just watch the day-to-day behaviors of the residents and how they react to each other. It’s what happens below the surface that makes things interesting, and that’s where the sublime visual components come into play. To call BN a beautiful film would be an understatement, as cinematographer jack Cardiff imbues the subject with a sense of grandeur that is amazing. However, BN isn’t just about pretty pictures, as the color design also helps move along the plot and make important points. When one character defiantly dons lipstick, the red dominates the frame and makes the action much more shocking than it should be. BN also attained a startling sense of realism despite the fact it was shot completely in England. Peter Ellenshaw’s matte paintings seem amazingly believable and they are marvelously integrated with the sets. I’d think that considering our greater acquaintance of visual techniques, we’d now see the flaws in the visuals, but I certainly couldn’t; I found the paintings to look terrific. Black Narcissus is something of an odd bird, and it’s a hard movie to nail in words. So much of its appeal comes from the visual realm, though I can’t say it’s all about the images. I thought the movie was also well-acted, from the simmering restraint of Kerr’s Sister Clodagh, to the almost-but-not-quite-psychotic tone of Byron’s Sister Ruth. Farrar provides an appealing though somewhat off-putting presence as Dean; he reminded me a lot of Ralph Fiennes, really, as he played the same kind of compelling but distant loner often portrayed by the latter. Though all of the other elements also seemed well executed, the appeal of Black Narcissus still comes down to its visual aspects. Without them, it would have been a good film, but as it stands, it seems like a much more substantial achievement. BN is a cinematographic wonder that has to be seen to be believed. 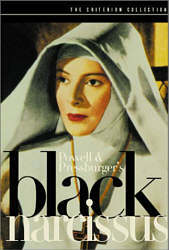 Black Narcissus appears in an aspect ratio of approximately 1.33:1 on this single-sided, double-layered DVD; due to those dimensions, the image has not been enhanced for 16X9 televisions. Although it displayed some definite problems at times, BN generally offered a very positive and occasionally lovely picture. Sharpness usually seemed positive. Most of the movie presented an acceptably crisp and well-defined image, though some scenes appeared mildly soft. Some of this may have resulted from the filmmakers’ intentions, but that element did not seem clear. In any case, the examples of softness were relatively minor and caused no substantial concerns. No signs of moiré effects or jagged edges marred the presentation. Print flaws looked fairly minor for a film of this vintage. Some grain appeared during the movie, and intermittent examples of scratches, blotches, grit, speckles and small debris also occurred. However, these stayed pretty small for the most part, and they were less problematic than one might expect for such an old movie. Black levels came across as acceptably deep and rich, and shadow detail looked fairly clear and appropriately thick. Colors were often very good, as the movie offered some nice icy blues and rich, warm reds. However, the hues displayed some of the film’s most substantial problems. For one, the tones varied a fair degree through the movie; they could be lovely and bold at times, but on other occasions they could look somewhat messy and drab. Most significant was the modest color “pulsing” that took place through virtually all of BN. This meant that most of the movie alternated between a look that was a little too blue to one that seemed overly red. The tones were mild and didn’t seem ridiculously exaggerated, but the effect appeared quite noticeable nonetheless. The “pulsing” looked most noticeable during shots of the sisters; their white habits really showed off the changing colors. Despite this flaw, I largely found Black Narcissus to offer a pleasing visual experience that often looked much better than I’d expect from such an old film. Less satisfying was the movie’s monaural soundtrack. Even for a picture of this era, the audio seemed weak. Dialogue often came across as shrill and edgy. Much of the speech appeared distorted, with a trebly element that made the lines sound rather unnatural. Music was affected less severely, though the score seemed inconsistent. Some parts of it appeared relatively clear and accurate, but many other elements were rough and harsh. Effects were less-strongly affected by the quality of the mix, and they usually sounded acceptably realistic when one factored in the generally-poor tones associated with the era’s soundtracks. However, the problems related to the speech and music were too severe to be overcome by decent effects, and I found the audio of Black Narcissus to seem fairly poor. We find a decent array of supplements on this DVD, starting with an audio commentary from co-director Michael Powell and filmmaker Martin Scorsese. Recorded back in 1988, this track appeared on the original Criterion laserdisc release of Black Narcissus. One of their earliest commentaries, unfortunately it isn’t one of their best, as I found this track to be intermittently informative at best. Powell and Scorsese don’t appear to have been recorded together, although the DVD’s case calls this “a conversation” with both of them, and early in his part of the commentary, Scorsese indicates that Powell will be along shortly. However, I could detect no signs of interaction between the two, and it sure sounded like they were taped separately. Much better was a new documentary called “Painting With Light”. Created by Craig McCall, the 26-minute and 35-second program features some general information about BN but it mainly focuses on Jack Cardiff, the film’s cinematographer. In addition to comments from Cardiff himself, we get a mix of film clips, behind the scenes stills, and interviews with Scorsese, actress Kathleen Byron, Powell’s widow - and noted editor - Thelma Schoonmaker. The show provides a very solid look at Cardiff’s techniques and his inspirations; as the title implies, he took his cues from artists like Van Gogh and really tried to create “paintings” on the film screen. It’s an interesting and informative examination of this legendary cinematographer’s work. The “Photo Archive” offers pictures in a few different areas. Taken from the private collection of Michael Powell, we get 83 “Production Stills”, 55 “Behind the Scenes” images, and 18 “Deleted Shots”. All of these are black and white photos, and some include explanatory text. These provided a nice look at the production. Lastly, we get the movie’s theatrical trailer, and critic Dave Kehr contributes a good text piece about the film in the DVD’s booklet. Black Narcissus offers 101 minutes of some of the finest photography ever filmed. The cinematography takes a potentially ordinary tale and elevates it to the level of something special; BN is the kind of film that should be required viewing for those who want to work in the field. The DVD shows some visual flaws but generally replicates the images well, and we get some good extras that provide further discussion of the movie’s techniques. However, the audio seems weak. Despite that last problem, Black Narcissus is a fine film that holds up very well after more than 50 years.